This was a fantastic Agatha Christie style murder mystery. I was hooked from the first words. perfect narrator too! 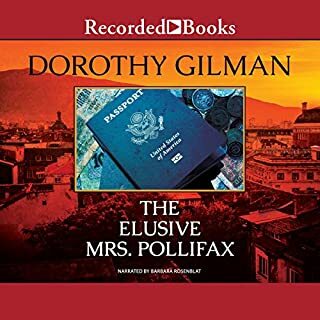 Would you listen to The Elusive Mrs. Pollifax again? Why? Yes. I have listened to this book twice already. I like this series in general. Barbara Rosenblat is one of the best narrators I have listened to and she does a great job of breathing life into the characters as she reads. In addition, this plot was a great hook to keep you interested in what is going on. Not too busy, and not too simple. What was one of the most memorable moments of The Elusive Mrs. Pollifax? One of the most memorable moments of this book for me was when Debbie, Mrs. Pollifax's newest unexpected associates, tell her that she wants to not like her, she's going to keep trying to not like her, but she can't seem to help it. It was very well delivered and and made me giggle. I have listened to many, many performances by Barbara Rosenblat and this was a terrific one. She has never disappointed me with her narration and I doubt she ever will. One of the most moving moments in this book for me was when Mrs. Pollifax visited the widow of the man who was trying to kill her to deliver the news not of her husband's death but of her nephews incarceration to blackmail her beloved brother. The woman's response was very emotional and the complexity of the emotion was portrayed so well it was difficult to listen to. I personally did not think it was necessary to add the "star-crossed lovers" motif to the story. There was not enough time and substance in the story to give it a real feeling and in the end it just seemed to be a desperate attempt to add more to a story that was not needed. 'He looks upon the murders that he did in fact perform as tiresome and regrettable necessities,' reflected Chief Superintendent Roderick Alleyn on the international crook known as 'the Jampot'. But it was Alleyn's wife, Troy, who knew 'the Jampot' best: she had shared close quarters with him on the tiny pleasure steamer Zodiac on a cruise along the peaceful rivers of 'Constable country'. 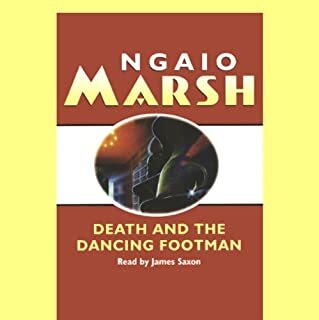 Would you try another book from Ngaio Marsh and/or James Saxon? Has Clutch of Constables turned you off from other books in this genre? I have found that Marsh's books in this series can sometimes be a bit dull at the beginning but I always end up enjoying them at the end. Have you listened to any of James Saxon’s other performances before? How does this one compare? James Saxon is perfect in my opinion for this series. When I think of Inspector Alleyn I hear James Saxon's voice. All of his performances I have heard I love. This is no exception. Was Clutch of Constables worth the listening time? Yes it was worth the time but I did feel there were parts that were unnecessarily drawn out. Part of what made this a low ranking book for me in the series is that I did not like the "storytelling" plot device employed by the author. The setting for this one is Inspector Alleyn giving a lecture to a group of young cops in training and telling of one of his unusual cases where his wife happened to be involved. Marsh often uses letters between Alleyn and Troy to relay information and such and I often tend to find it a bit irritating, but in this one she took it even further and would flip back and forth from Alleyn's telling of the case to the recruits, and Troy's experiences while it was happening and then later Alleyn's experience while it was happening. It made it very hard to keep up with what timeline you were actually in and it often caused a break in the continuity of the story which irritated me greatly. It was a horrible death: Maurice Questing was lured into a pool of boiling mud and left there to die. Chief Inspector Roderick Alleyn, far from home on a wartime quest for German agents, knew that any number of people could have killed him: the English exiles he'd hated, the New Zealanders he'd despised, or the Maoris he'd insulted. Even the spies he'd thwarted...if he wasn't a spy himself. I am going to depart a bit from my normal template I use when reviewing so if anyone is used to my regular posts, I hope you don't mind. This book was a surprise for me. I am a huge Ngaio Marsh fan but when I was originally reading these, I could not find this title in any of my used bookstores. A couple of decades later and I am now listening to all of the titles in order on audiobook. Since I have started listening to these I have been biased and prefer the editions narrated by James Saxon. I have yet to listen to a Nadia May that I really connected with. When this one started the first thing that threw me was the narrator. My initial reaction was that I did not care for Ric Jerrom as the narrator, however, within a few chapters he had completely won me over. (Surprise #1). He has a great range and does quite a bit of vocal acrobatics with the characters. Some of them grated on my nerves, but I soon realized they were supposed to. 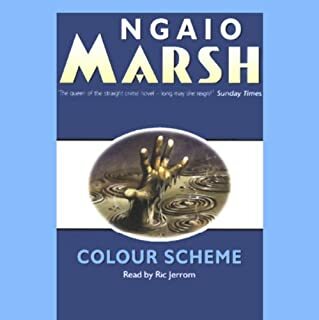 Continuing on I have habitually struggled with the novels in this series that are based on Maori backgrounds (being a flatfooted, dull American myself) and often do not enjoy them as much. When the story started I was pretty sure that was going to be the case as I quickly got lost in the magnificent names and terms and such for the local tribe. However, once again, after a few chapters I found that I was lost in the story and was oblivious to all of those things as the plot unfolded. (Surprise #2). As for the plot and characters, this is now among my favorites of this series in both. The characters were delightful (even the ones that I didn't quite like). None of them were so over-the-top that you simply could not identify with them or that they felt "unreal". I enjoyed the interplay of the personalities throughout the book and was soon predicting how the characters would react to the situations and what they would do next. I simply adored the primary character in this book which was not Roderick Alleyn (Suprise #3), in fact although Alleyn is mentioned several times throughout the book he isn't truly introduced until the end. The plot itself was one that you could feel building and could even predict somewhat what was going to happen, which I normally do not enjoy, however, in this book it completely worked at sucking me in and keeping me on the edge waiting for the murder to happen (Surprise #4). Finally, the ending where the killer is revealed and explained I found to be phenomenal! I loved how surprising it was and yet how it all worked in completely with the plot that had been building. 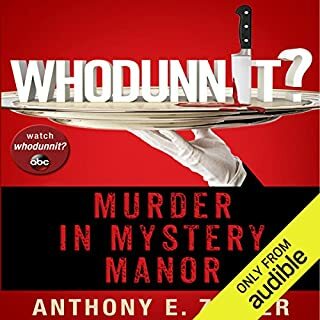 There were multiple red herrings (as you should expect with Marsh book), but this is one of the few where I truly did not even begin to guess before it was revealed yet was not disgusted at the unlikeliness of the convention explained as to why the murderer was the person it was. I highly recommend this book to any and all fans of Ngaio Marsh, Roderick Alleyn, or even those who have never read one before. This is one of the few that does not need to be read in order (although you will not giggle at the Fuchling references as I did when the cranky old doctor kept using them). It began as an entertainment: eight people, many of them enemies, gathered for a winter weekend by a host with a love for theatre. They would be the characters in a drama that he would devise. It ended in snowbound disaster. Everyone had an alibi, and most a motive as well. But Chief Detective Inspector Roderick Alleyn, when he finally arrived, knew it all hung on Thomas, the dancing footman. 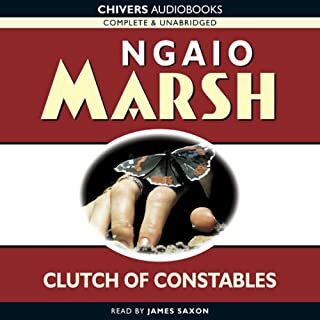 Narration - Of the narrator's of Ngaio Marsh books, James Saxon is my favorite. In some of the recordings the quality makes him a bit hard to understand, but overall his tone and narrative style suit the Roderick Alleyn series perfectly. Characters - The characters in this book are an ensemble cast of enemies at a house party hosted by a bored man who wants to build his own real-life drama play. I found there were no characters in this book which I disliked entirely which therefore kept me vested in the book more than some. The mix of characters with their quirks makes for an enjoyable read. Plot - It is definitely best read these in order as Marsh often refers to characters and plot points from previous books throughout this series. This is one of my favorite books in the series. The plot starts out with a lot of foreboding as the organizer of the house party explains his guest list to his primary guest and explains how he has invited a family whose mother dotes on the youngest son while the oldest adores her in return and dislikes his brother, in addition the elder brother is bringing his fiancee who was first engaged to the younger brother. In addition, the younger brother's new mistress is invited as is her rumored other paramour and her business rival, who happens to be the cousin of the party organizer. Interesting times ahead. The book is full of red herrings and side stories. Definitely a "Must Read" for fans of this genre. 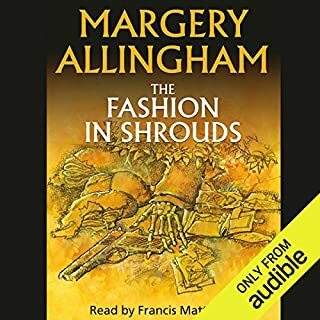 Narration - Another novel featuring Hugh Fraser (the actor who portrays Captain Hastings in the A&E Series) as a narrator for the Poirot stories. His voice is very smooth and he nails the inflection in tones to really bring the story to life. Characters - This was Christie's second installment in the Poirot series and picks up some time after the first. 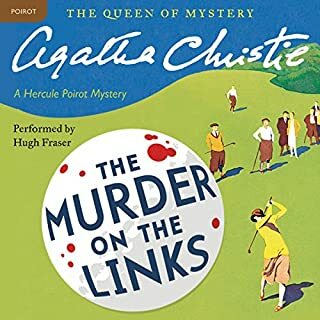 Poirot and Hastings are further developed in this novel than the first and the characters are less exaggerated giving them a more realistic feel. The supporting cast were adequately developed, especially Hastings' latest romantic love interest. The main plot characters outside of the Poirot & Hastings duo, are two families bound by two generations in very different ways and have a lot of back story. One of the central characters, felt a bit like a copycat of Gaston Leroux's Frderick Larson character from the Mystery of the Yellow Room and it got to be a bit annoying for me by the end because they were so similar. Other than that I found the characters to be interesting and helped really understand the plot. Plot - It is definitely best read these in order as Christie often refers to characters and plot points from previous books throughout this series. The plot in this book seemed to remind me of a Sherlock Holmes plot but I'm not sure if it it actually mirrors one or just the tone was very similar. Overall it was a fascinating story and it kept me engaged and interested in the outcome. Not my favorite Poirot, but definitely one I enjoyed even the second or third time through. Narration - I was ok with Stephanie Cole's narration. I was not loving it, but I did not hate it. I found it to be suitable for the book, there was just something about it which I did not love but I cannot quite put my finger on what it was. Characters - This was Christie's second installment in the Miss Marple series and picks up some time after the first. The characters were interesting on the whole for this book. Miss Marple was developed a bit more, but the primary focus was on the characteristics of the Jefferson family and the Bantry's. None of the characters were unbelievable, but somehow the Jefferson's seem to fall a little flat for me. Plot - I would recommend reading this series in order as characters from one often pop up in later novels. If you do read them out of order it does not really inhibit your understanding of the current book but some of the references may not make much sense in bits. Overall this plot was fun and kept the reader engaged. I felt as though there were some elements which were a bit far fetched or ridiculous, but overall it was enjoyable. If you enjoy cozy mysteries from this era, you will likely enjoy this book. 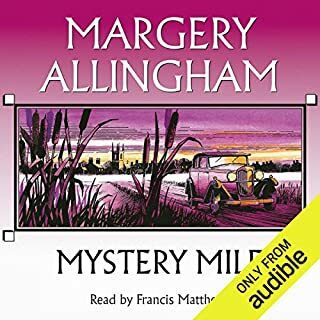 Narration - I love the A&E Miss Marple series starring Joan Hickson so I was excited to listen to this edition. Unfortunately what I did not take into consideration is that that Ms. Hickson does not necessarily have the best voice for such things. Due to her soft tone I found many areas hard to understand and had to reverse and listen again to pick up what happening. Her inflections and all that were great, but I found that I simply did not enjoy her narration as much as I hoped. Characters - This was Dame Agatha Christie's introduction to her readers to Miss Marple, and although she is not as well rounded as in other books and is not even the main focus of the story, it was a nice introduction which set the scene for her later development. The other characters were all very well developed and likable or not likable as Ms. Christie intends. As is the case with most of her books the characters are realistic in the meaning that she shows their strengths and weaknesses and makes you feel like they could be people you know in your everyday life. It is part of the reason her novels are so timeless. Plot - The plot is a very well constructed "whodunit" and as always we are provided with a lot of subjects to choose from who all have their own reason for wanting the demise of the murdered man. Listening as the vicar makes rounds hearing all the inside happenings from the members of his flock as they all tell each others secrets and actions was a fun way of exposing all the possibilities and reasons and background. I think every single person is made to look guilty at one point or another in the story which is always fun as you try to determine who really committed the crime. I did find the ending a bit of a let down and bit too far fetched on how it all worked out, but not more so than other mysteries I have read of similar settings. 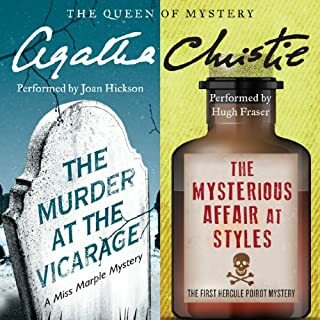 Narration - As disappointed as I was with Joan Hickson as a narrator for the Miss Marple series, I was as equally pleased with Hugh Fraser (the actor who portrays Captain Hastings in the A&E Series) as a narrator for the Poirot stories. His voice is very smooth and he nails the inflections in tones to really bring the story to life. It was especially fitting for this book as it is told from Captain Hastings point of view. I like him almost as well as I like Simon Prebble as a narrator. 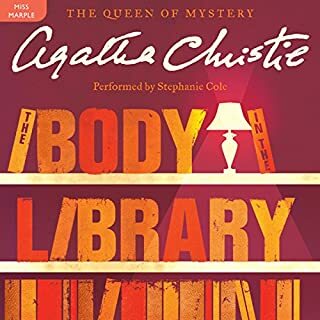 Characters - This was Christie's first introduction to Poirot and he does not appear until a few chapters in as the story focuses on Captain Hastings return from the war and how he fits into Poirot's life. It introduces the three major recurring characters in all the Poirot novels - Poirot, Hastings, and the infamous Inspector Japp (although his character is not as well introduced as the others). Being the first book the characters are a bit more exaggerated and less "real" then they become in later novels as she spends time accentuating their foibles that make them unique. The supporting cast of characters were a bit weak in this novel possibly because the reader has so many to keep up with, but over all they are not unlikeable or unbelievable, just a bit underdeveloped. Plot - The plot in this book is well constructed and complex as the one from the Murder at the Vicarage, but again I felt the ending was a bit rough. Just not enough to make the reader buy into it and you almost don't care by the time you get there. I cant' really comment too much more without adding spoilers which I don't want to do. I believe fans of Agatha Christie will note that the ending reveals a plot which she develops better in one of her other novels but I won't say which one, but I will say it is a novel that was executed much better in building up to the unveiling than this one. All in all I would rate the first story as a 3 star and the second as a 4 star so I am going with the 3 star due primarily to problems with the endings and Hickson's lack of success in my opinion as a narrator. First novel staring Albert Campion and his man Lugg. Narrator: Francis Matthews - good job. Good inflection and change in characters. Characters - The characters are very well developed in this book, except for the villains as I am starting to notice as a flaw in Allingham's equation. This is technically the second Albert Campion novel (although in the first one he was more of a side character), and in both the only fringe characters not given much backstory or attention ended up being the bad guy. There was a great ensemble cast of characters given and each one was a likeable individual. Plot - The basic plot of the story was a good little jaunt fitting to the time period which kept you guessing as to who was involved and what was going on. There were many red herrings thrown in for fun as well. I had two major issues witht he book overall however. The first issue I had was the love interest. At the beginning of the story they hint at a romance that never really develops even though it is initially portrayed on both sides. At the end one of them ends up with another and the other is heart broken. This was very irritating to me as I found it unnecessary to set up the love triangle. Especially involving the main character. It came off as a bit melodramatic and pointless. The second issue I had was that the reason behind the attempts on the judge's life was not really explained satisfactorily. The ending left me feeling as though Allingham wrote the entire novel and then realized she needed to explain why it took place and inserted a half-baked stupid explaination in a dramatic manner just as a way to dispose of the villain at the end. It all felt very contrived and dull. Plus she drug out the whole explanation out for too long so you hit the climax when the villain is unveiled and then just keep hoping that it ends soon. I plan on reading the next book in the series and that will determine if I continue with the series or give it up. Especially since so far I can only find a copy narrated by David Thorpe and I did not enjoy his narrative on the first book (The Crime at Black Dudley).